“When we travel to other countries the flight depends on the invitation. We travel by any class the donor selects. It is not an issue for us. Those who kept mum when Mahinda Rajapaksa travelled with an entourage of 300 to 400 people when he travelled abroad or those who had tight lips when special flights were arranged to bring down dogs to this country are the ones who talk about a photograph of Comrade Anura Dissanayaka on board. 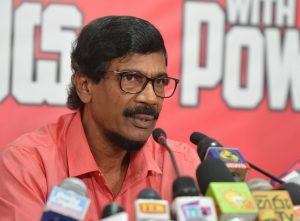 The system that we want to build is not one that the members of one family could travel first class but a system where first class is available to anyone who wants to travel,” says the General Secretary of the JVP Tilvin Silva. He said this joining an interview with a Sunday newspaper. There are only two weeks for the local government election. What have you got to say about it? We have almost completed our campaign at a very satisfactory level. We have addressed a large portion of the society. We have been to various places in the country. In all these places we noticed that the people are ready to move on a progressive path. The biggest advantage in the election campaign is for the JVP. The government or parties with the government have no advantage at the election. On the other hand, the groups with Mahinda Rajapaksa too have been rejected by the people. It has been established throughout the country that only the JVP could stop frauds and corruption and develop the country. We believe that a new tendency in politics would come into existence with the local government election. Doesn’t every party say the same story? We are unable to give figures now stating these are the local councils we can win. However, we could emphasize that we would achieve a massive victory. People who never supported us in previous elections, those who had never attended our meetings and discussions have rallied with us at the election. Also, a large number of intellectuals, professionals and artists directly or indirectly support our campaign. All of them tell the people to cast their vote for the JVP. As such, we could definitely say that we have the best advantage at the election. You had been saying you would form a broad front to face elections. However, you have entered the fray all by yourselves. What happened to the broad front? Of course, we would enter the forthcoming provincial council election too as the JVP. However, the broad front we have talked about would be created in the future. Those forces that would form the broad front are supporting us at the election in different ways. Some of them are on our nomination lists as well. Also, university lecturers and professors, artists, professionals and scholars are rallying around this front. As such, the front will come forward with strength in the near future. The people who support political parties and their leaders were called ‘henchmen’. They had to come down to that level. Will people call these individuals and organizations that rally around the JVP and the front it leads also as ‘henchmen’? There is a clear difference between ‘henchmen’ and those who support us. The reason such ‘henchmen’ support their political parties and their leaders and the objective of individuals that support us is different. Their aspirations and wishes are different. The expectations of ‘henchmen’ are personal. They expect various privileges when the party they support comes to power. However, those who rally with us do not have personal agendas. Their aspirations are for a righteous country, righteous society and progressive and democratic administration. They do not support a political party expecting to get a house, a vehicle, positions or other privileges. It is such people that rally around the front we create. The parties in the government say any work for the village or the town could be done only if the parties that rule are given power in local councils. Won’t it be disadvantageous to the JVP if people accept this view? First of all, I should say this talk about only the party in power could carry out development is a blatant lie. The UNP, the SLFP and the clique calling themselves the ‘joint opposition’ have blackened their names politically. A large number of individuals who have been accused of frauds, corruption and crimes and have been prosecuted are in all three groups. As such, many of them are unable to face the society. Despite forwarding nominations for the election, they are scared of the response they would get from the masses. This is why they come out with various fabrications. This talk about the ruling party should be given power in local councils is a story without any essence. All these are people who have destroyed the village or the town. They have destroyed the economy and now they have nothing to tell the people. We made Thissamaharama Pradeshiya Sabha the best local council in the country on two occasions. With this, we have proved this talk is a lie. We tell the people if they want to see how local councils could be developed without the power of the ruling party give the power of the local council to the JVP. You say the present system in local government councils is chaotic. How would you change this system if you get power in local councils? We hope to follow a new process in local councils that would bring in development. No one would be allowed to steal, bribe or have under the desk dealings and tender rackets would be completely eradicated. We have shown this could be done at Thissamaharamaya. A town or a village should be developed without any political bias. We have no system where only the party or members of the party benefit. The senior official in councils too would not be allowed to do whatever they like. We would work so that grants would be equally distributed. Going on foreign tours spending large amounts of money has become a habit in many local councils. No one has brought any benefit to the councils from these tours. This should be stopped. Only the most essential things should be chosen. The funds in the council should be usefully utilized. They should be used for the development of the council and the citizens. We have a methodical process to earn money and to spend them usefully. All those councillors who get elected to local councils would not spend the allowances they get as members of eh council for their personal use. This would go to a common fund to be used for the common good of the citizens of the area. We have given this example and we would continue to do so. No other party could do this. Recently, Parliamentarian Johnston Fernando had said that the JVP has been bought by Malik Samarawickreme. Now, this story has gone to court. First of all, it should be said that the story is a blatant lie. Everyone knows who Johnston Fernando is. He is known for stealing and corruption and has been prosecuted for such crimes. We have already taken legal action against the mudslinging. It would show who the rogue is. The bankrupt politicians who stole from government institutions accuse us. There are politicians who have received money from the LTTE as well. We’ll expose such politicians in the future. Anura Kumara Dissanayaka flying first class when going abroad has become an issue for some. When there is nothing to say against the JVP they try to hang on to something. The photograph that was published in social media recently is a very old photograph. When going abroad we can go by any class. What’s wrong with that? Are only the fraudsters who plundered the resources of the country expected to travel first class? When we travel to other countries the flight depends on the invitation we get from the organization that invites us. We travel by any class the donor selects. It is not an issue for us. Those who kept mum when Mahinda Rajapaksa travelled with an entourage of 300 to 400 people when he travelled abroad or those who had tight lips when special flights were arranged to bring down dogs to this country are the ones who talk about a photograph of Comrade Anura Dissanayaka on board. The system that we want to build is not one that the members of one family could travel first class but a system where first class is available to anyone who wants to travel. You still pretend you don’t get it. How can you expect the public to trust you when it’s obvious that you are lying through your teeth? When the Great King, (as being addressed by a significant populace of Sri Lanka), travels in luxury, people understand it. When the self-appointed savior of the poor, is caught napping in the Business Class going to handle his foreign assets (god knows how a staunch socialist amasses such wealth), that’s hypocrisy. I don’t want to insult your intelligence by assuming you don’t get it.